Patients’ Organizations and Their Opinions: How Much Have They Been Taken into Consideration When Regulating Stem Cell Research? As advances in stem cell research have accelerated, a growing chorus of concern has emerged worldwide, that traditional values have been put aside in the quest for scientific progress. Almost uniquely within biomedical research, stem cell research offers the potential to improve the health of patients living with a wide range of medical conditions. At the same time, such research also poses deep ethical and moral dilemmas that may impede the progression of the development of new medicines or therapies, that aim to improve the lives and suffering of patients living with a variety of complex disorders. 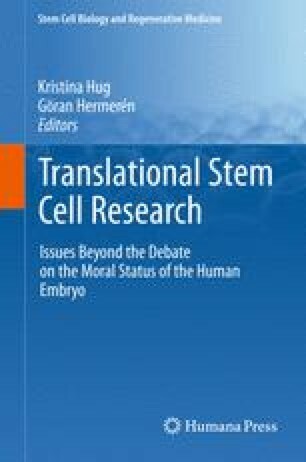 Medical and religious ethics have been drawn into a complex social and political debate around future directions of stem cell research and how this should be funded within diverse national and European systems. The development of the patient advocacy movement, within diverse international health care systems has now developed into a profoundly influential force that, for the first time, is now engaged in the debate around the allocation of European research funding and the future directions of translational stem cell research. Patients with a variety of conditions have expressed views that their suffering is real now and is often profound. This suffering needs to be considered in the context of a complex moral and ethical debate, particularly where this is driven politically active groups, whose views or beliefs are not shared by patients. How do we, as a diverse society, pursue research in order to alleviate long term suffering and endeavour to progress research sensitively, all within a pluralistic society? In this context, religious ethics also have to be considered within a multi faith framework and progress needs to be made, while trying to reconcile the diversity of viewpoints. Future research directions must be pursued with stringent and enforceable rules, regulations, and public oversight, anchored both in law and reverence. With the further extension of influence of the patient advocacy into the realm of health care research and perhaps, the allocation of health care funding, we must make a plea for patient responsibility and awareness of the needs of all constituencies within an increasingly complex international health care environment. President’s Advisory Commission on Consumer Protection and Quality in the Health Care Industry. “Quality First: Better HealthCare for All Americans,” Appendix A, Consumer Bill of Rights and Responsibilities, Chapter 4: Participation in Treatment Decisions. March 12, 1998.